Determined to find meaning in the midst of war, Captain George Tyger reflects on his faith, his prejudices, and his privilege, and shares the unique perspective he has gained while serving and ministering in a war zone. As an Army chaplain deployed to Afghanistan, George Tyger has seen and experienced things that many of us cannot fathom: naked children throwing rocks at him in the street, a playground in the middle of a Taliban graveyard, and incredible violence, anger, loneliness, and fear. Determined to find meaning in the midst of it all, Tyger reflects on his faith, his prejudices, and his privilege, and shares the unique perspective he has gained while serving and ministering in a war zone. Perhaps nowhere is the desire for certainty and precision more pronounced than in a combat zone. We are far from the familiar. Uncertainty surrounds us. In such situations, we crave solid ground on which to stand. It is easy to reach for the one thing that we believe must be certain, unchangeable, immutable—our idea of God. The problem is that God then becomes something less than ultimate, a possession, an idol built in our own image. Soon that God becomes our God and no one else’s, the God-on-our-side. The next step is to imagine that whatever we do in the name of God is okay. . . . The authentic God is necessarily ambiguous and—if we are honest—arrives not as a fact but as a possibility. God exists in the world only in as much as we bring God into the world through our lives. "As a nation, we have been at war for over a decade. 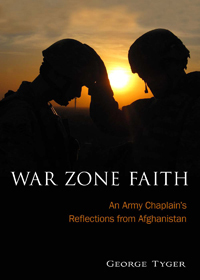 Into this arena enters our military chaplain corps, armed with nothing but faith, courage, and compassion. Chaplain (Captain) George Tyger represents the best of such ministers to our armed forces. George's words reach my heart just as they have touched the lives of our soldiers, helping us all find our way home."